Traditional Chinese Medicine (TCM) is a complete system of medicine developed in China. Its roots are in writings and practices which were developed over millennia. 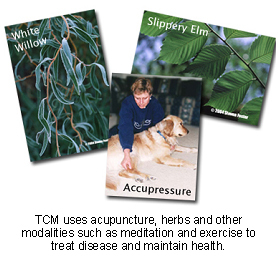 TCM uses acupuncture, herbs and other natural substances, acupressure, food therapy, meditation and exercise to maintain health and treat disease. The Chinese medical view is that each living creature is a small part of the infinite universe, and is subject to the same laws that govern the rest of the cosmos. Therefore, an understanding of health requires an understanding of the laws of nature. "The TCM practitioner views health as a state of harmony or balance existing between the internal environment of the body and the external environment it lives in." The TCM practitioner views health as a state of harmony or balance existing between the internal environment of the body and the external environment it lives in. Unfavorable climactic conditions, emotional upset, physical trauma, infectious organisms, poor nutrition, inappropriate lifestyle, heredity, and other pathogenic factors are capable of disrupting this state of harmony. 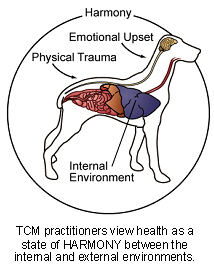 TCM developed a metaphoric or schematic model for how the internal body operates that incorporated the same principles of balance and harmony that govern the ecology of the natural world. Health and disease are viewed simply as two different self-perpetuating cycles, both of which are resistant to change. Organ interactions are the stepping stones in each cycle. When they are mutually supportive, the spinning of the cycle allows the organism to throw off illness. When they are mutually antagonistic, the spinning of the cycle makes the organism resistant to all but therapies which directly address the stepping stones (organ interactions) in the cycle of disease. From the TCM perspective, chronic disease is not chaos, but a highly stable state, which explains why it is so difficult to resolve. Largely due to cultural taboos, most civilizations in the world prior to the advent of modern medicine lacked definitive knowledge about the inner workings of the body. In order to address illness in the absence of detailed medical knowledge, most cultures developed schematic or metaphoric models for how the body worked. Almost all believed that individuals have inherent strengths and weaknesses. Since we are born with these weaknesses, they are viewed to pervade our systems and to have somehow contributed to most of our health problems. These weaknesses are echoed in everything, including our behaviors, our appetites, our childhood illnesses, and even how our tongue looks or our pulse feels. Chinese medical diagnosticians take a comprehensive history and perform a detailed physical examination to disclose as many of these manifestations as possible. The goal is to understand what metaphoric mechanism can best explain all that has happened or is currently going on with a patient. This dynamic state is then treated, usually using acupuncture, herbs, or diet. Preventive measures, such as appropriate diets, improved relationships and healthier lifestyles, are then introduced to help the body regulate itself, and thus compensate for these specific weaknesses and reduce disease susceptibility in the future. What is the history of Traditional Chinese Medicine in veterinary medicine? TCM has been used in Eastern cultures to treat humans for thousands of years, and Traditional Chinese Veterinary Medicine (TCVM) has used the same concepts and methods of diagnosis and treatment to treat animals for a similar period of time. In China, practitioners of veterinary medicine undergo an exhaustive training program in TCVM, which parallels the training programs for practitioners of TCM. In the Western world, veterinary practitioners of TCM have generally taken auxiliary training in the theories and practice of Traditional Chinese Medicine after receiving their veterinary degrees. "...complete mastery of TCM demands years of study under expert teachers..."
Although complete mastery of TCM demands years of study under expert teachers, the basics of TCVM can be learned in condensed courses and applied to clinical cases with good results. On which species of animals is Traditional Chinese Veterinary Medicine practiced regularly? TCVM is regularly practiced on all species of domesticated animals. Who practices Traditional Chinese Veterinary Medicine and do I need a referral? Because of differences between animals and humans in their anatomy and physiology, both the American Veterinary Medical Association and the Canadian Veterinary Medical Association consider the practice of TCVM, including Chinese herbal therapy and acupuncture, to be the practice of veterinary medicine. "...it can only be practiced by a licensed veterinarian..."
As a type of veterinary medicine, it can only be practiced by a licensed veterinarian, or under the direct supervision of a licensed veterinarian, according to the regulations in the specific jurisdiction. Practitioners of veterinary TCM must possess the necessary training and experience in this form of medicine. In North America, as veterinary TCM becomes more accepted, there are an increasing number of veterinarians in private practice who possess this expertise. In many cases, referral is not necessary. What conditions are most often treated with Traditional Chinese Veterinary Medicine? TCM can be used to treat almost any imbalance in health except that which absolutely requires surgery. Acupuncture can be useful to achieve sedation or anesthesia in patients, thus reducing the need for anesthetic agents in some surgical procedures. Typical conditions that can be successfully treated with TCVM include inflammatory bowel disease, hormonal disorders, epilepsy, allergies, cancer, kidney and liver failure, behavioral problems, and chronic lameness, just to name a few. How can my pet benefit from Traditional Chinese Veterinary Medicine? 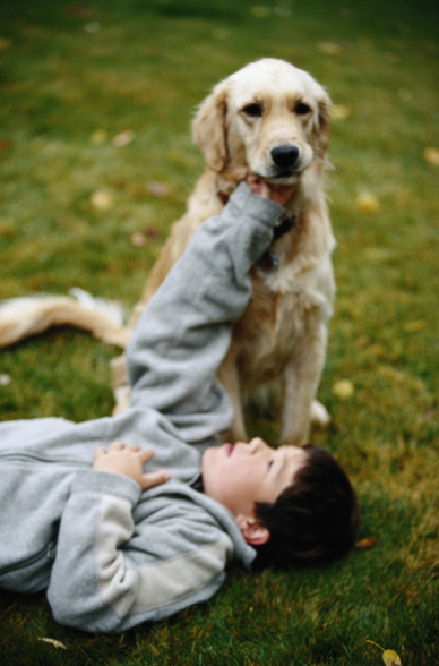 Pets benefit from TCVM because of its emphasis on both the prevention and treatment of disease. As a comprehensive form of treatment, TCM considers the interrelationship of all the patient's symptoms, and treatment is aimed at restoring health rather than merely alleviating symptoms. Ironically, the value of TCM in the treatment of disease in a modern world lies in its use of somewhat arcane concepts and its general metaphoric approach to medicine. "...a response to an acupuncture treatment or herbal formula frequently suggests that a particular diet might be helpful." Whereas a response to a particular pharmacologic product or drug may not imply the appropriateness of any preventive measures, a response to an acupuncture treatment or herbal formula frequently suggests that a particular diet might be helpful. Lifestyle measures that have the same metaphoric impact can be introduced, resulting in continued improvements and stability after acupuncture, herbs, and even drugs are withdrawn. When herbs and other treatments are found effective, their mechanisms of action can be researched. Frequently, new mechanisms of disease are discovered that can be applied to the development of new conventional treatments. "TCM should not be viewed as a competitor of conventional medicine, but a source of inspiration." TCM should not be viewed as a competitor of conventional medicine, but a source of inspiration. How successful is Traditional Chinese Medicine? 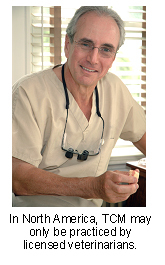 TCM is very successful in the hands of the appropriately trained practitioner. The success of the treatment of chronic conditions will vary according to the age of the patient, prior treatment history, degree of pathology and commitment to incorporating all facets of TCM into the patient's lifestyle. When used by properly trained practitioners, TCM is safe and adverse reactions are uncommon. "If administered incorrectly, therapies can worsen conditions rather than improving them." If administered incorrectly, therapies can worsen conditions rather than improving them. Caution should be used if the patient is pregnant or has serious illness. What is the cost of Traditional Chinese Medicine? Comprehensive TCM treatment involves a thorough history taking and physical examination, followed by a patient assessment and formulation of a treatment plan. It rarely involves a single visit, and costs will vary according to the specific condition being treated, the need for acupuncture or traditional medicines and the response of the patient. The fees associated with diagnosis and treatments are set by the individual practitioner, and will often reflect the skill, experience and training of the practitioner. In some cases, use of TCM in the treatment of chronic disease may result in considerable savings compared to the costs of conventional treatments. Can Traditional Chinese Medicine be combined with other types of veterinary medicine? While it is possible and even common practice to combine TCM with other treatment modalities, some precautions should be observed. "...inappropriate combinations with some other types of medicine may cause unexpected reactions." Acupuncture and some herbal formulas are very potent forms of treatment, and inappropriate combinations with some other types of medicine may cause unexpected reactions. Combinations of treatment can make if difficult to determine what is working well, or whether the different treatments are interfering with each other. As a complete and well-developed system of medicine, TCM is highly effective as the sole form of treatment for most conditions except those requiring surgery, and is used that way by skilled practitioners. "TCM practitioners have the knowledge and skill to understand the interactions between different forms of treatment..."
TCM practitioners have the knowledge and skill to understand the interactions between different forms of treatment and to interpret the patient's response to therapy. If your pet is receiving treatment from a practitioner other than your regular veterinarian, it is imperative that both individuals are kept updated about the ongoing treatment in order to provide coordinated care of your pet, to allow proper evaluation of treatment and to minimize avoidable interactions. How can I find out more information about Traditional Chinese Veterinary Medicine? The most efficient way to find current reference materials, links, and referral lists is to consult the Alternative Veterinary Medicine website at www.altvetmed.org. This client information sheet is based on material written by: Steve Marsden, DVM ND MSOM LAc DiplCH AHG, Shawn Messonnier, DVM and Cheryl Yuill, DVM, MSc, CVH.